Aveeno Daily Moisturizing Lotion moisturizes skin for 24 hours and provides broad spectrum protection from aging UVA and burning UVB rays. It is a breakthrough body lotion with natural colloidal oatmeal and patented active photobarrier complex. Aveeno Active Naturals Daily Moisturizing Body Lotion UVA and UVB protection. Clinically shown to moisturize for 24 hours. 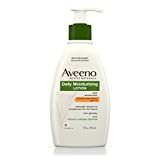 INDICATIONS: Aveeno Active Naturals Daily Moisturizing Body Lotion with Sunscreen SPF 15 is a breakthrough body lotion with natural colloidal oatmeal and patented active photobarrier complex, moisturizes skin for 24 hours.